Cutthroat Lake is a tarn, a lake filling a natural basin formed in a glacial cirque, in the Uinta Mountains. The enclosing mountains are composed of Neoproterozoic Uinta Mountain Group quartz sandstone and micaceous shale. This view is toward the northwest, Summit County. Photo by Ken Krahulec. Doug Sprinkel, Senior Geologist, Utah Geological Survey. Doug Sprinkel is a senior geologist in the Geologic Mapping Program at the Utah Geological Survey. His principal responsibility is to map the geology of 30′ x 60′ quadrangles that cover the Uinta Mountains and Uinta Basin. In addition to his mapping efforts in northeastern Utah, Doug has mapped quadrangles in the central Utah thrust belt. Other ongoing projects include a regional study of Early and Middle Jurassic strata and regional Mesozoic unconformities. 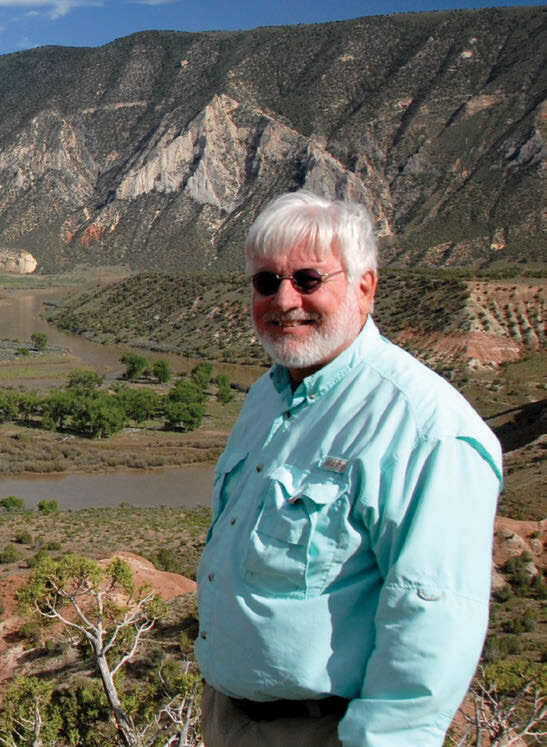 Doug has co-edited four popular books on Utah geology and authored or co-authored 10 geologic maps and nearly 100 professional reports, articles, and abstracts. The Uinta Mountains are one of Utah’s premier mountain ranges. Rising above the Uinta Basin in Utah on the south and the Green River Basin in Wyoming on the north, they stretch from near Kamas eastward into northwestern Colorado. They form the roof of Utah, having more peaks greater than 11,000 feet than any other mountain range in Utah, and our only peaks over 13,000 feet, including Kings Peak, our highest at 13,528 feet. 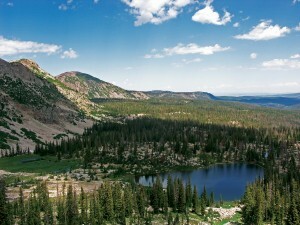 However, the Uintas are a tale of two geographies, so much so that many people refer to the “western (or high) Uintas” and the “eastern Uintas.” I have often wondered why the high peaks—and glaciation—are concentrated in the western part of the range and why the Uinta Mountains consist of two anticlines. I was also curious why the eastern part of the range is seemingly bent. Why the difference? The answer may lie in part in the long geologic history of this part of Utah, and in a newly recognized fault zone that seems to cut across the range. Most scholars of the Uinta Mountains know that the story began more than 1.7 billion years ago, and most know that the mountains we see today formed during the Laramide mountain-building event between about 70 and 34 million years ago (mya). But, many Utah geologists may think that since 34 mya the range has just sat there, passively being carved away by streams and glaciers, not fully realizing it has been structurally modified by Tertiary extension during the past 23 million years. Recently, through new research and mapping, we have learned that there is much more to the story—we now recognize that structural changes began at the end of the Precambrian (Neoproterozoic), that the Uintas have large active faults that may present an earthquake hazard today, and that at times these faults localized mineralization. These answers are arising from 15 years of detailed geologic mapping in the Uinta Mountains and Uinta Basin by the Utah Geological Survey, with additional supportive mapping and stratigraphic studies by other researchers and their students, including Carol Dehler (Utah State University), Bart Kowallis (Brigham Young University), Paul Link (Idaho State University), Charles “Jack” Oviatt (Kansas State University), and Joel Pederson (Utah State University). Below, I outline a case for a previously unrecognized fault zone that bisects the Uinta Mountains and remains active today. But first we need to briefly review the older history of the range. Regional tectonic events drive the uplifts that form most major mountain ranges, and the Uinta Mountains are no different. Their existence is largely due to the compressional forces of the Laramide orogeny (orogeny means a mountain-building event). The Laramide uplift folded rocks in the Uintas into a broad arch or anticline, which is actually formed of two separate anticlinal culminations. 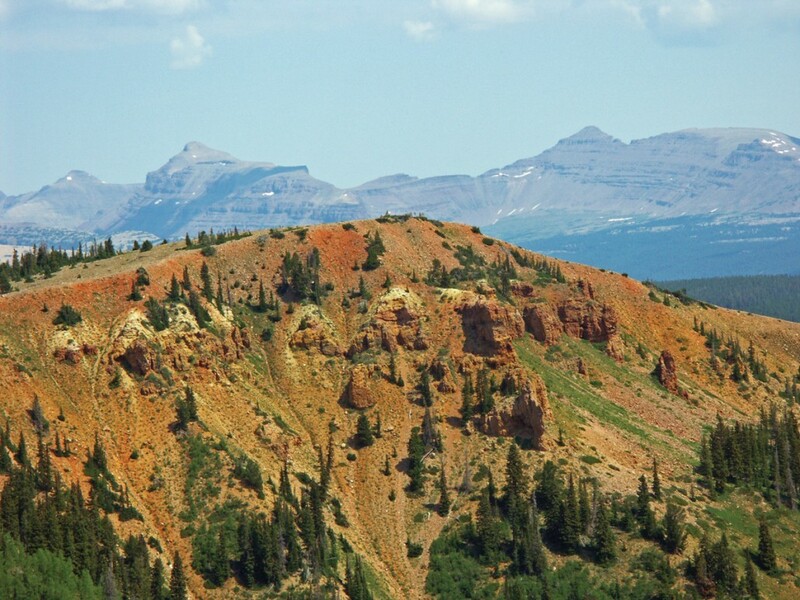 The Uintas rose along a set of faults—the north flank, Henrys Fork, and Uinta- Sparks faults on the north flank, and a smaller complimentary fault system on the south flank called the basin boundary fault. The north flank system generally parallels the Cheyenne belt, a weak zone in the earth’s crust that marks the “suture” where the ancient (2.6 billionyear- old) Wyoming province was “stitched” to a younger plate called the Yavapai-Mazatzal province about 1.7 billion years ago. This weak zone has influenced structures in the Uintas ever since. During part of the late Neoproterozoic (about 770 to 740 mya) it formed the northern boundary of a faulted basin in which a huge amount of sand, gravel, and mud accumulated that today are rocks of the Uinta Mountain Group and form the core of the Uinta Mountains. The Uintas owe their east-west trend to this ancient boundary. We also know that other tectonic events modified the Uinta Mountains structure. The Sevier orogeny was a thrust-type compressional mountain- building event from about 130 to 40 mya that in part overlapped the Laramide orogeny in time and space. The westernmost parts of the Uinta Mountains and Uinta Basin preserve the different structural geometries of the two orogenies. More recently, Tertiary extension modified the Uinta Mountains by lowering the eastern Uintas as early as about 23 mya, but most actively from about 15 mya to present day. Our new mapping has helped clarify the older and younger parts of the story—I propose that a northwest-trending fault zone bisects the Uinta Mountains and is largely responsible for the west-east division of the range. This inferred fault zone is not obvious because it does not regionally offset Paleozoic and Mesozoic rocks, but the alignment of a series of oblique subsidiary folds and short northwest-trending fault segments help constrain its position. I first suspected that a range bisecting fault zone may be present after examining digital elevation data looking for fault scarps in the Diamond Mountain Plateau area. I noticed a linear trend extending from known fault scarps on the plateau, northwest through a broad structural saddle in the center of the range, to the apparent termination of the north flank fault zone. Other structural features also seem to terminate along this lineation, including the south flank fault zone and a fault zone on the north side of the Uintas near Utah State Road 44. The inferred fault zone may also help explain the two anticlines and their different orientations and misalignment. Although the fault zone does not significantly cut Paleozoic and Mesozoic rocks, Uinta Mountain Group (UMG) rocks are cut. In a 2007 geologic map of the Dutch John 30′ x 60′ quadrangle, the UMG in the eastern Uinta Mountains consisted of the basal Jesse Ewing Canyon Formation overlain by a thick unnamed and undivided interval, and capped by the Red Pine Shale. Since release of that map, Carol Dehler and her students divided the unnamed interval into three new informal formations (Diamond Breaks, Outlaw Trail, and Crouse Canyon) and we extended the overlying Hades Pass formation, an informal unit in the western Uintas, into the eastern Uintas. This new stratigraphy, combined with detailed new mapping shows that, interestingly, this inferred northwest-trending fault zone actually placed the older Crouse Canyon formation near the capping Red Pine Shale, making the intervening Hades Pass formation anomalously thin near Leidy Peak. Additionally, thickness variations of the Hades Pass formation are common all along the inferred fault zone. Timing of movement on the inferred northwest-trending fault zone must be near the end of Precambrian (late Neoproterozoic) time because the UMG formations are offset and tilted westward but the overlying Paleozoic rocks have little to no offset or pre-Laramide deformation. In addition, the Paleozoic formations overlie progressively older parts of the UMG in a generally eastward direction making a regional angular unconformity. So, the evidence is strong that this fault was active in the late Precambrian—what about my claim that it has also been active since the late Tertiary? Lines of evidence include earthquake data, mineral occurrences, and offset Tertiary and Quaternary deposits and surfaces. Let’s look at a few of these briefly. The southeast extent of the inferred fault zone is along a fault scarp on the Diamond Mountain Plateau. The fault scarp is likely in middle Pleistocene gravel that covers the Oligocene Bishop Conglomerate, which suggests the fault could be considered potentially active. A widely spaced cluster of small earthquake epicenters that plot along the fault scarp and in the inferred fault zone supports this hypothesis. If true, the inferred northwest-trending fault seems to be a reactivated major Precambrian fault and is one more example of a pattern found so often in the Uinta Mountains, old structures being reborn as new structures in different tectonic settings. The Uinta Mountains are a remarkably unmineralized mountain range; however, a plot of mines and mineral occurrences shows that much of the mineralization that does exist is closely associated with faults including the proposed northwest-trending fault zone. The copper producing Dyer mine and associated mineral occurrences seem to lie along the inferred fault zone. A remarkable feature of the Uinta Mountains, the Gilbert Peak erosion surface, provides another line of evidence. The surface formed about 34 to 30 million years ago after the Laramide orogeny and prior to Tertiary extension. The Bishop Conglomerate blankets the Gilbert Peak erosion surface along the south flank of the Uintas, but the surface is mostly bare, with the exception of thin unconsolidated Quaternary deposits, on the north flank. Faults cut the Gilbert Peak erosion surface at many places, including across the projection of the inferred northwest-trending fault on the north flank, indicating that movement must have happened in the middle Tertiary or later. Displacement data indicate that many faults first moved as compressional Laramide-age faults, and were later reactivated as extensional Tertiary faults. The inferred northwest-trending fault zone can explain many of the intriguing features we observe in the Uintas, including the abrupt eastward termination of the high Uinta peaks, the various structural features on the north and south flanks of the range, and the two distinct anticlinal culminations. It helps clarify the long history of the Uintas, including an early period of compressional deformation in the late Neoproterozoic (between about 642 and 541 mya) in which the UMG basin was inverted, folded into a subtle low-amplitude anticline, and faulted. Like the later Laramide orogeny, the late Neoproterozoic uplift occurred along faults that paralleled the Cheyenne suture. This event produced a subtle, generally east-west-trending fold that extended from Colorado to western Utah and eastern Nevada to form the Uinta-Cortez arch. This deformation also faulted the UMG along the inferred northwest-trending fault zone, creating the initial bisection and possibly the two anticlinal culminations. Precambrian west-southwest movement on the inferred fault zone placed older formations of the UMG on the east up against the younger formations of the UMG on the west, and may have set the stage to give the later eastern mountains their unusual bend. At the end of the Precambrian, the UMG was also eroded into an undulating paleotopography prior to the deposition of the Paleozoic formations. Much later, during the Laramide orogeny and uplift of the Uinta Mountains, the inferred fault zone may have had some movement, but most of this deformation was accommodated by enhancing the amplitude of the two anticlines and forming smaller folds oblique to the trend of the zone. The fault zone moved again during late Tertiary extension, but this time the eastern part of the range moved down relative to the western part. Lowering the eastern Uintas along the reactivated inferred fault zone and other faults offset the Gilbert Peak erosion surface, caused a reorganization of the drainage system, and terminated the string of high peaks of the Uintas. Timing of mineralization associated with the inferred fault zone and others faults in the Uinta Mountains is unclear but is likely Tertiary in age. Proximity of earthquake activity in the eastern Uinta Mountains with the inferred fault zone is intriguing. Much more work is needed to define clearly the position and extent of the inferred northwest-trending fault zone and constrain its deformational history. It is an interesting structural feature of the Uinta Mountains, and if proven, can explain many of the topographic, geomorphic, and geologic oddities of the range.